For those of you who are familiar with Matthew Bourne's work then you will not be disappointed in this retelling of the Cinderella story through dance. The show is a mixture of contemporary dance and ballet reflecting the skills of this amazing choreographer. The story is set in the London Blitz of the 1940s and uses the score from Prokofiev which provides the haunting and atmospheric music of the show. The stage set is dramatic with all the sounds, light and noise we would expect during the London Blitz. The set was expertly transformed; it was one minute a bombed ballroom and next a moon lit scene of ethereal quality. I did find the story a little confusing at times, who was who, who was dead and who was alive. Plus there were some sub plots around to add to the mix. But that said, the dancing was superb and the atmosphere was enchanting. The whole cast were excellent so it's hard to single out anyone although I did think that the Angel played by Paris Fitzpatrick held the story together. 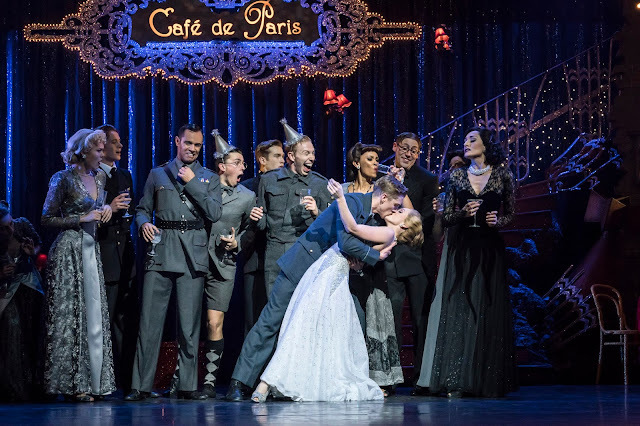 Cordelia Braithwaite was beautiful and mesmerising as Cinderella and Will Bozier played the handsome pilot. Most of the cast seemed to play several parts so it was a highly energetic performance. This is a show not to be missed. Cinderella is on at MK Theatre until the 17th February. Shappi Khorsandi - THE STABLES - TONIGHT!